The DP6060 Series process meter combines two independently programmed analog inputs with powerful math functions to make an advanced meter capable of handling complex math requirements common in the process industry. Various math functions may be applied to the inputs including addition, difference, average, multiplication, division, ratio, and more. A customizable dual-line display allows a wide variety of input variables, math calculations, or units and tags to be displayed based on your application needs. Sunlight readable display models have an extraordinarily bright LED display. 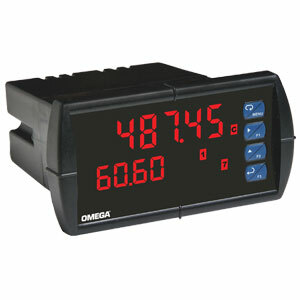 The DP6060 has two red LED displays, an upper display 15 mm (0.60") high, and a lower display 12 mm (0.46") high. Each display is a full 6 digits (-99999 to 999999). The displays can be set up to read input channels (A or B), math function channel C, toggle between A & B, B & C, A & C, A & B & C, toggle between channels A, B, or C & units, the max/min of any of the channels, including the math channel (C), set points, gross (without tare) or net (with tare) and gross values of channel A or B, or the Modbus input. No jumpers to set for input selection. All setup and programming are done via the front panel. Three levels of password protection help maintain the reliability of the programming. The Copy feature is used to copy (or clone) all the settings from one DP6060 to other meters in about 20 seconds! The Copy function is a standard feature on all meters. It does not require a communications adaptor, only an optional cable assembly. The DP6060 minimizes the menu selections by auto-detecting the installed options to determine what menu navigation is required. Note: Comes complete with 2 side mounting brackets and operator’s manual.